[student signatures]: Grace McCart, Dorothy Parrish, Sally Rasmussen, Ann Binnicker, Pat Goffman, John E., Margery D., Gary Fahl, Mildred H., Patsy St., Darlene W., Margaret Griffiths, Charles Lambert, Nanette O., Sally Powers, Ora Lichtenberg, Ronnie Brown, Lewis R., Georgia W., Raymond Casselman, Valerie Gibbs, Yahoody, Carol Larien. Description Pin holes in each corner.Sign held by student: Lake Grove School, no. 410, May 3, 45. Label: 2005 donated by Pat Baars. 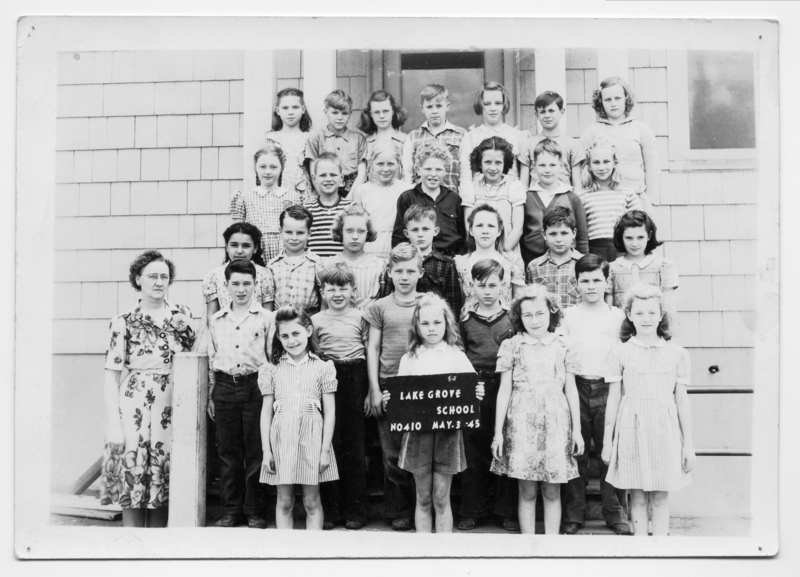 Patsy Hargreaves (Baars) is front row, 2nd from right. Transcription [student signatures]: Grace McCart, Dorothy Parrish, Sally Rasmussen, Ann Binnicker, Pat Goffman, John E., Margery D., Gary Fahl, Mildred H., Patsy St., Darlene W., Margaret Griffiths, Charles Lambert, Nanette O., Sally Powers, Ora Lichtenberg, Ronnie Brown, Lewis R., Georgia W., Raymond Casselman, Valerie Gibbs, Yahoody, Carol Larien.